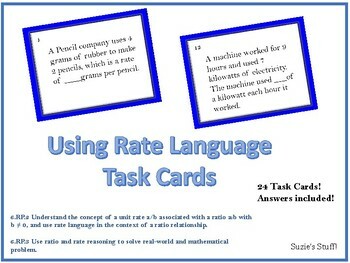 Using Rate Language - Task Cards! 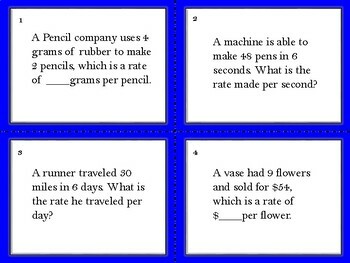 This is a set of 24 task cards with real-world problems. The students must read the problem, set up the ratios, and find the equivalent ratio. The first 12 problems have whole-number answers while the final 12 have fractional answers. I display one problem at a time and have the students answer using whiteboards. 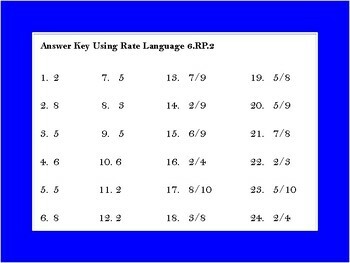 This is a fast way to assess understanding while at the same time providing instructional variety.